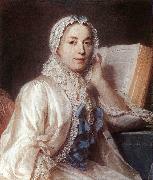 French Rococo Era Painter, 1704-1788 French pastellist. 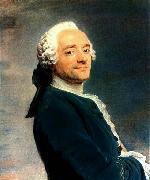 He was one of the greatest pastellists of the 18th century, an equal of Jean-Simeon Chardin and Jean-Baptiste Perronneau. Unlike them, however, he painted no works in oils. Reacting against the stately portraits of preceding generations and against the mythological portraits of many of his contemporaries, La Tour returned to a more realistic and sober style of work. The fundamental quality of his art lies in his ability to suggest the temperament and psychology of his subjects by means of their facial expression, and thereby to translate their fugitive emotions on to paper: 'I penetrate into the depths of my subjects without their knowing it, and capture them whole', as he himself put it. His considerable success led to commissions from the royal family, the court, the rich bourgeoisie and from literary, artistic and theatrical circles.